where 20 bloggers have redecorated one room in six weeks. with a blue and white ticking upholstered bed. and enveloped by all the fun, leafy patterns. using white bedsheets and blankets, it calms the effect a bit. I added some blue and white elements to the adjoining bathroom. added this week…made by Woody Liana. Note: her shop will be restocked after she finishes a big custom order, so check back. can reverse for a different look. Martyn Lawrence Bullard’s “Kaba Kaba” in linen. The paisley side of the 22″ square pillow is made with a Les Indiennes linen (sorry, it’s discontinued). So, which is your favorite pillow combination? Circle and Leaf or Stripe and Paisley? and motivating six week challenge. Check out what these other ladies have completed!!! Stunning! 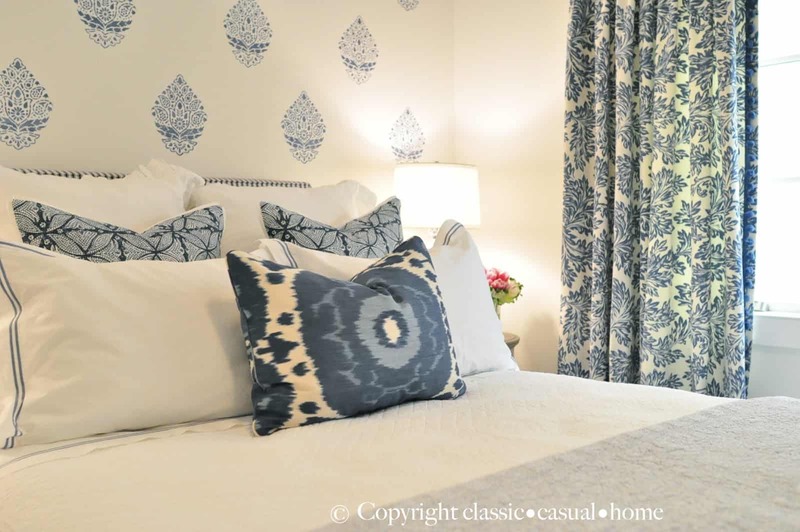 Love your fabric selections and the idea of the reversible pillows. Also the "block printed" wall treatment! A very welcoming spot for your guests! Beautiful job Mary Ann! Just gorgeous – that wall is over the top beautiful!!! Please link up to a party I'm cohosting today? Blue and white is such a classic and you did a marvelous job of combining blue and white patterns. The block printed wall is fantastic. Mary Ann I love the space you created! Makes me want to do everything in blue and white now! Mary Ann, this is so peaceful and beautiful. You gave your daughter the lamps too? I love the shot from the bathroom into the bedroom. All the pillows are fantastic, and I could never decide which side to show. I had no idea Martyn B had a fabric line. Where have I been? That picture of you at the end is a great professional touch. Bravo! Mary Ann…it looks beautiful…I would love to stay in a room that looks like this. Your guest will feel very comfortable… They wont want to leave! Love both sides of the pillows. I'm packing my bags as I type this- I want to come be a guest in this room!! What a relaxing, lovely space for your daughter or any guest! 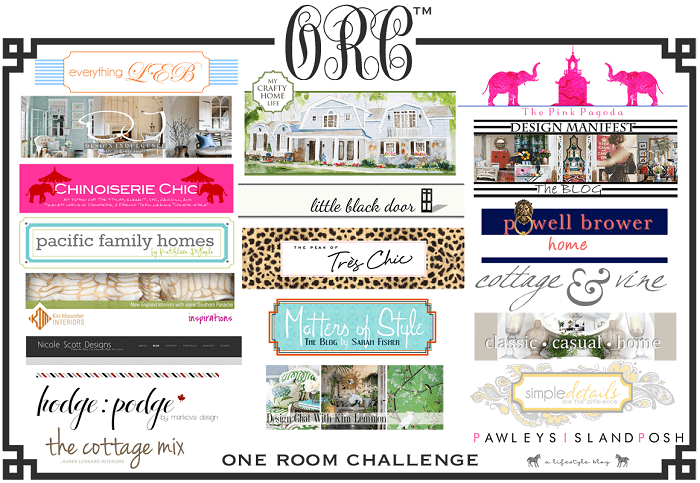 I LOVE what you did here, favorite guest room Challenge winner! I love how it turned out. You did a beautiful job. Now I am so inspired. Thank you! I am SUCH a fan of blue and white that I have to say it's fabulous! I'd stay in a minute…in fact, you'd have to THROW me out! 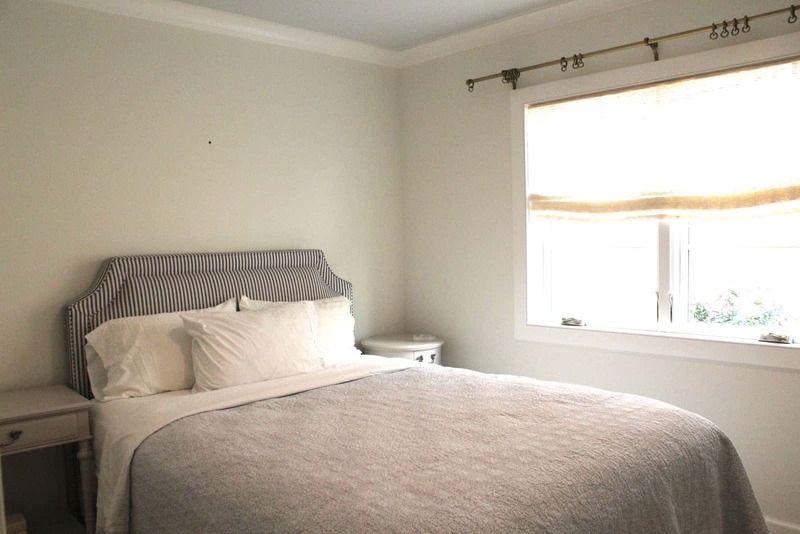 Your guest room is absolutely perfect! When can I come for a visit? I am so excited to see this room all finished! It is absolutely beautiful and I love every single detail! Your guest room is perfection! 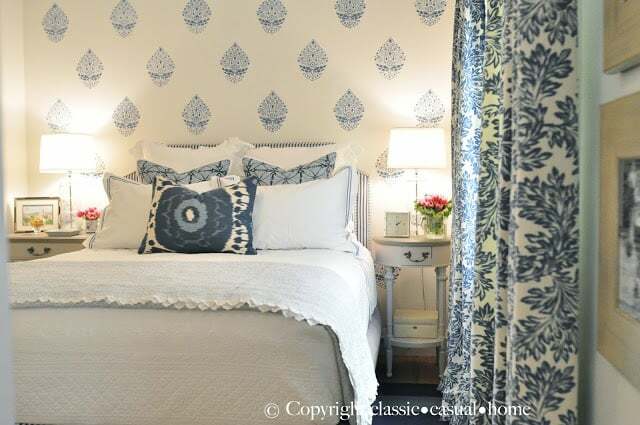 Love everything especially the stenciled wall, upholstered bed, pillows and curtains! You did an amazing job! 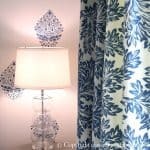 To say that I love it would be a grand understatement – I have always loved blue and white together and this turned out beautifully!!! 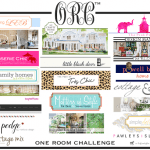 This has been a terrific series Mary Ann – so many great tips and ideas for re – doing a room on a budget. Having reversible pillows is another great tip and one I wouldn't have thought of (which is one of the many reasons I love your blog!!!) As for which pattern I like best? I honestly don't think I could choose – they are ALL lovely but I do love the Kaba Kaba print! You did such an amazing job!! It looks so gorgeous. I just love the curtains, and stenciling. What a lovely room for your guests. I don't think they will want to leave. Lovely! So fresh and has your perfect coastal signature style! I really love this room! 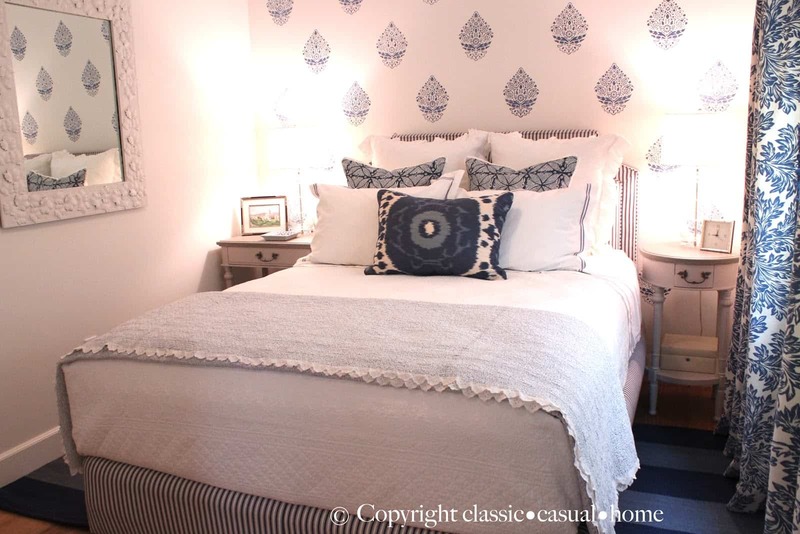 The stenciled wall, the ticking stripe and those pillows!!! Great job. Mary Ann, your guest room is lovely! It is filled with beautiful color and texture, most of all with loving attention to detail. Mary Ann, fabulous job as I knew you would. Love all the blue and white. Just so fresh and pretty. It truly turned out to be a beautiful bedroom. Such fun seeing it all come together and the bath too. That is one of the most beautiful bedrooms I've seen online. Just perfect. Love, love, love the blue and white. I love it!! Love the pillows especially, they are so beautiful! I'm going there after this. All the details are so spot on, I just love your style Mary Ann!! I could lay down and fall right asleep! All the Best! So absolutely beautiful! The trim on the curtains is perfection! I love this room, you used my favourite palette! 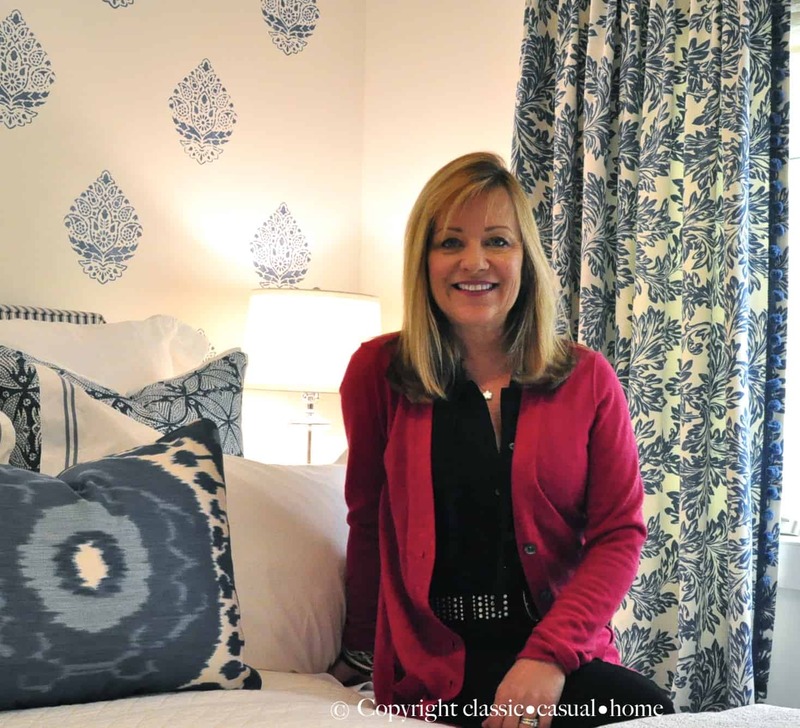 I love the paisley and stripe combo – I am partial to paisley! Well you did it again Mary Ann – another beautiful room that I love. You have such a lovely way of bringing patterns and designs together; it's gorgeous! Such a refreshing look! Your daughter will be happy to come home to this! I like them both ways! Simply beautiful Mary Ann!!!!! I love every inch of it. A classic! Loving the circle side of the pillow…so cute! Beautiful room Mary Ann! Every detail is fantastic! Fun and surprising! I'd love to stay in that room-very welcoming! Great job! 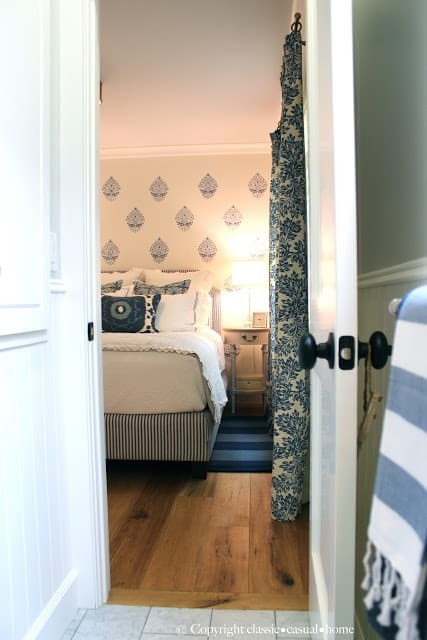 OK, this makes me want a blue and white room for sure. Love it, so peaceful and relaxing. Definitely a guest retreat! Really beautiful room and, from a guy's perspective, it's not too pretty. Really, really nice job! Wow, Mary Ann! This is a stunning reveal! I love what you have done with this space. I also love that the pillows can be switched around for a different look. I can't decide which way I like them either. Both sides are beautiful! Spectacular! One of THE prettiest guest rooms Ive ever seen. I may take big hints from this for mine which desperately needs updating. 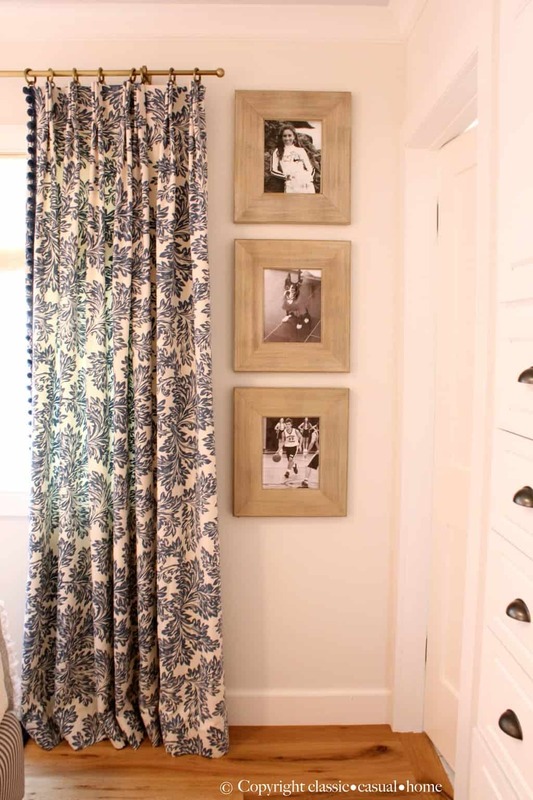 I love your fabrics- they make this space!!! You have amazing style and taste, and truly looks personal and welcoming and so professional. Great job! SOO pretty!! I just love every single thing, what a cozy, elegant and stunning room you have created in my most favorite color combination..blue and white!! You did such a beautiful Mary Ann..now the big question, when can I come and visit? beautiful!!! the wall is my favorite part but i love every inch! I love your blue and white room and of course that wall is to die for! Great job and this has been the inspiration for my blue and white bedroom. Your guest room is so inviting. I love the colors and patterns you used. "sheer perfection"!!! The pillows were the finishing touch that pulled the whole room together. Great job Mary Ann. You "ARE" the winner for sure!!! what a fabulous room! i love how it turned out! love the navy and blue. 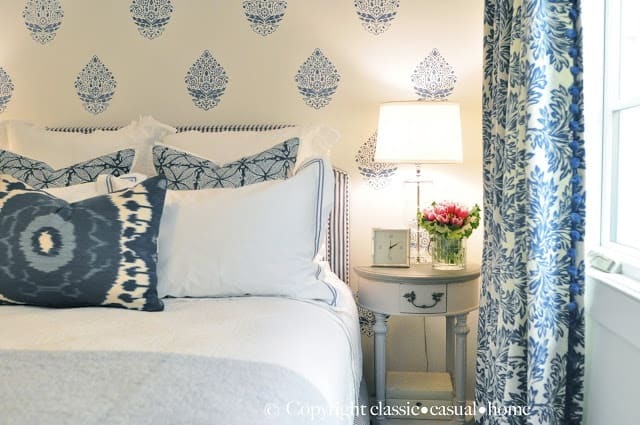 the stenciling on the wall is terrific and love the throw pillows on the bed. The drapes are terrific also! great job! The room turned out beautiful! And I love how you extended the blue and white into the bathroom as well. The room is so beautiful! Congratulations! I really love the blues and love the Indie fabric …. 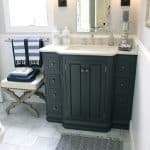 the bathroom cabinet is so special.!! everything you have done in these to spaces are great! This room is just gorgeous! Every little detail is beautiful….I like the circle and leaf pattern so it does not compete with your gorgeous stencil work. Love the pop of pink flowers and you wearing pink….enlarge that one! 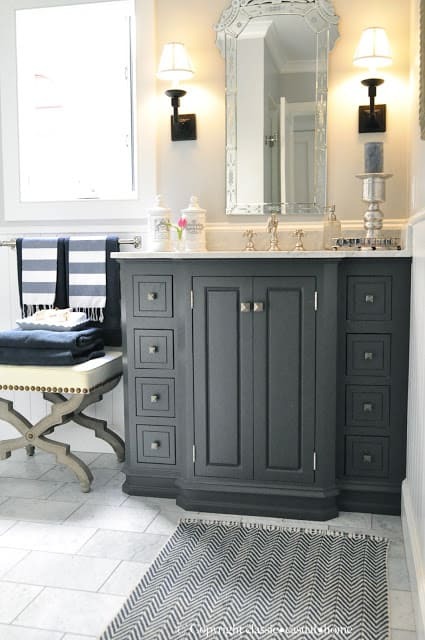 Love the bathroom too! Congratulations, Mary Anne. The room is beautiful. Any guest would be thrilled to stay here. Proof read, I tell myself. Didn't listen this time. Sorry for misspelling your name. 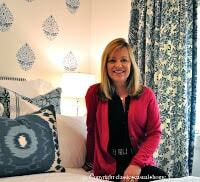 I think your guest room turned out fabulous! Love the blue and white! The room is so fresh and crisp with wonderful details! You did good girl!! 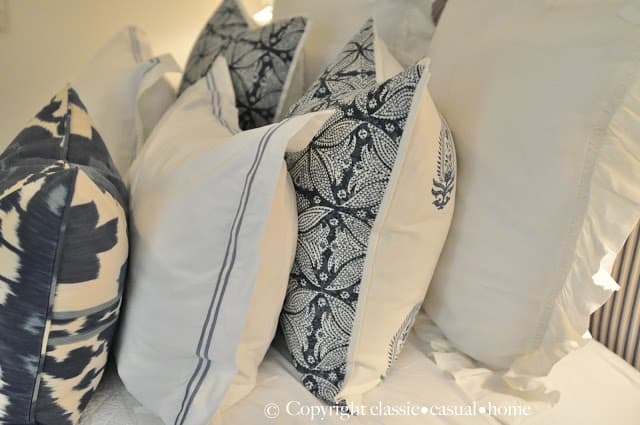 mary ann – im dying over those pillows. everything looks amazing though. i love it! bravo! What a great job. I love the way the guest room and bathroom turned out. You did an amazing job. I like the pillows as they're shown in the first image. Your guests will feel so welcome and comfortable. Mary Ann, you never cease to amaze. How did you know that the leafy prints and other coordinating patterns would envelope your guests for a feeling of restful elegance? Answer: because you are gifted! I love both sides of the 22" pillows and would personally switch them around as someone else suggested, then stop by to admire the eye candy whenever I could. You've inspired me again…but first I must finish your lovely plan for my great room! Gorgeous! I just love the blue tone on tone look. The front pillow is one of my long time favorites. I was just playing with the fabric this week! Mary Ann, what a fabulous job! Congrats! You are so very talented! The room transformation is wonderful, Mary Ann! I love the fabric and the pillows. 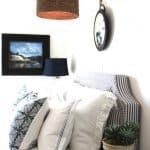 Your guest room looks fantastic – you're going to have a hard time getting your guests to leave 😉 My favourite combo is the leaf and circle, but the other looks great too. I just love the little pompoms down the side of the beautiful drapes and the whole calm blue and white palette. Just gorgeous! As always, just beautiful, Mary Ann! I don't think you can go wrong with either look…I love them both! I'm leaving another comment! I finally had time to check out all the other bloggers "One Room Challenge" rooms, and though I thought everyone did a great job, you still take first prize!!! Not only for your overall room design and finishes, but for the way you photographed and posted it! Great job, Mary Ann!!! Omg. That is so incredibly gorgeous it made me gasp. Really. I dont even know what my favorite thing is because every detail is beautiful. I have so enjoyed following along….your room turned out amazing! Those pillows were definately the crowning glory! Love them!! This turned out beautifully! I am absolutely in love with this space! OMG Mary Ann, I can't get enough of this room, and get so excited every time I see a new post about it. Apart from the fact it's blue and white, clearly my favourite, I just love everything you have done with it. So welcoming, fresh, comfortable, stylish and with a relaxed elegance. Beautiful room. So well done! I love it ! It's gorgeous ! I really like the curtains, the pillows and the frames ! Thans for sharing this, you must have worked so hard on this room. Cheers from france ! I can't pick a fave combo, just keep switching them:) I love, LOVE blue and white!!! Have been collecting it for 30 years now! I just did OUR guest room and adjoining bath in blue and white too. It isn't totally done yet, I have got to paint the dresser in there SOON! Your room is gorgeous! I recently came across your blog and just wanted to say what a beautiful room you created! 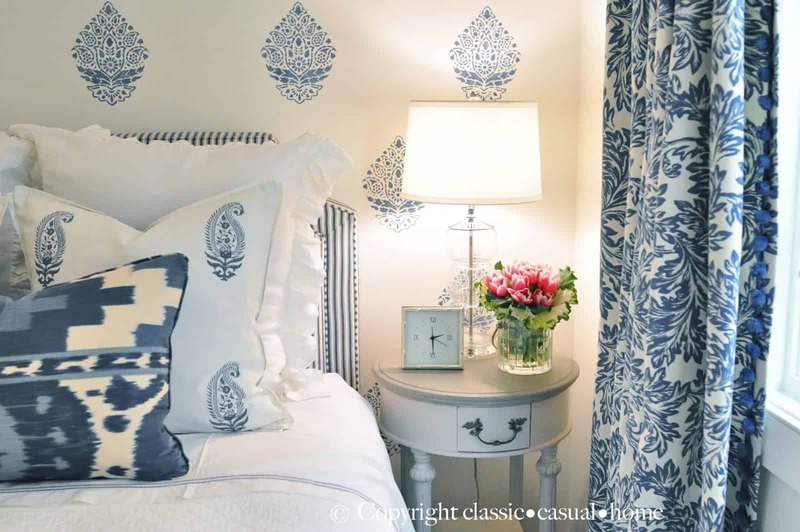 I love the play on all the blue and white–it feels like such a fresh take on a classic look. And I also really love the adjoining bathroom!! Feeling very inspired–so thank you! I saw that you are in San Fran. We are just north of you a bit–my husband works at Travis Air Force Base and we live in Davis. I look forward to reading your blog!